CRM reviews offer the best recommendation for anyone looking to buy a CRM system. CRM reviews posted by real customers not only give endorsement but help demonstrate how the software has changed their businesses. At Really Simple Systems we actively encourage our customers to post CRM reviews on independent software review sites such as Capterra, G2 Crowd, GetApp, Crozdesk, FinancesOnline and TrustRadius. They provide genuine, first-hand feedback of their experiences, so helping others in their CRM search. I love RSS. The support is outstanding. The interface is highly customizable and intuitive. I use this on a daily basis and it does wonders for our advertising company. 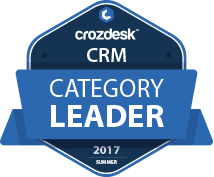 Our customers consitently review our product as one of the best CRM systems on the market. They say they love our customer support and 96% have recommend us to a friend! Have used Really Simple Systems in several companies now and have found it a must have sales tool. The functionality allows me to keep track of the whole sales process and keep track of customers.